For staffing firms specializing in commercial staffing, it’s crucial that job orders get filled quickly with the best‑qualified candidates. If you need to place a several hundred-strong workforce for an immediate assignment, you can’t afford to be slowed down by inefficient and error prone business processes. 1Staff allows industrial staffing firms to find qualified candidates quickly and sort through resumes thoroughly. Background and certification checks can all be speedily carried out using 1Staff. Staffing agencies can easily obtain and store electronic DocuSign signatures in 1Staff. With 1Staff, recruiters can meet tight onboarding deadlines. 1Staff is fully configurable, allowing users with the right security permissions to create custom workflows, dashboards, forms and reports. When users post an open position on the internet and receive resumes from applicants, 1Staff identifies keywords from the resumes and tracks each stage of progress through the hiring cycle. With 1Staff, sales and recruiters can keep on top of all their customers and candidates with advanced CRM functionality and marketing campaigns. 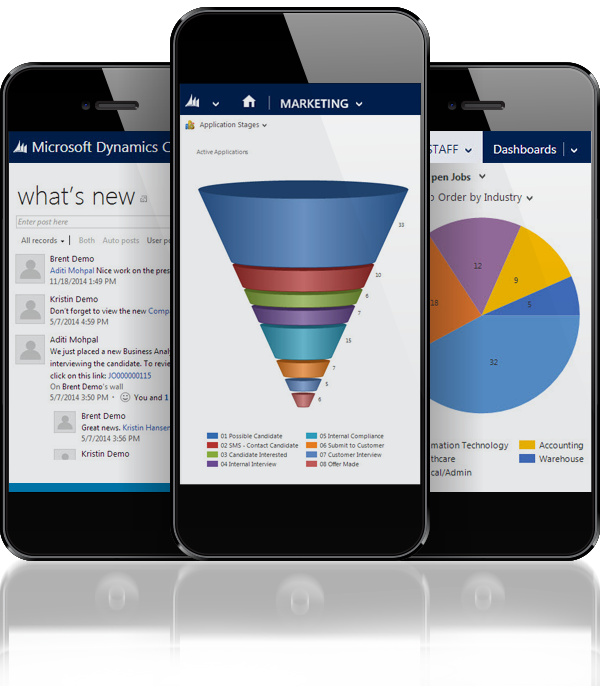 Users can also email candidates and customers through Outlook, and automatically log all conversations in 1Staff. 1Staff automates the entire onboarding cycle. Periods of peak demand (e.g., Friday at 5pm or Monday at 8am) can be accommodated without creating bottlenecks that slow the process. With 1Staff, processes become streamlined, allowing staffing professionals to focus their attention where it’s needed most. 1Staff can also help streamline the pay/bill and back office processes for light industrial and other types of commercial staffing. If a client requires paper timesheets for approval, 1Staff can capture an image of the timesheet and attach it and any other related documents to an invoice. Time can also come into 1Staff from an electronic file import for time kept in Excel, time clocks or timekeeping systems.